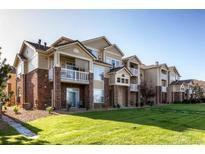 Below you can view all the condos for sale in the First Creek Farm subdivision located in Aurora Colorado. Listings in First Creek Farm are updated daily from data we receive from the Denver multiple listing service. To learn more about any of these condos or to receive custom notifications when a new property is listed for sale in First Creek Farm, give us a call at 720-729-2338. Short walk to clubhouse, fitness, pool and playground area all within gated community. Convenient access to DIA. MLS#2374189. RE/MAX Professionals. Great location minutes from DIA; 25 mins to downtown; 2 mins from light rail; and 5 mins from the acclaimed Gaylord Rockies mega Resort & Convention Center. Owner occupants only. MLS#2979253. Bonterra Real Estate. Just a few miles to new light rail station and across from dog park! MLS#3056310. Suraya, Inc.. It's ready to call home. MLS#6196917. 5281 Exclusive Homes Realty. Call the listing agent with any questions. Balcony with storage closet. MLS#1953787. HomeSmart Realty Group. The unit is in immaculate condition with 2 beds and 2 baths including New Kitchen Granite Counters, Subway tile backsplash, New carpet, New floors in Kitchen, Laundry Room and Bathrooms! MLS#4315400. Platinum Real Estate Services. Located close to the newest and hottest Gaylord Convention center and shopping center this location is ideal. Please, come have a look! MLS#9461427. Milehimodern. Unique opportunity for an incredible condo! ! MLS#3402702. Colorado Home Realty. Located minutes from DIA, 25 minutes from the Denver Tech Center, and 30 minutes to Downtown Denver and close to the new Gaylord Convention and Shopping Center. MLS#1736544. Madison & Company Properties. This community is blocks away from the newly built Gaylord Rockies Resort and other hotels, minutes away from DIA. MLS#4941314. BENFINA PROPERTIES LLC. First Floor Corner Unit with great floorplan: Two private master suites- one on each side of the kitchen, All one level living in this slightly larger model, Brand New Carpet/pad and Paint, 2 Patios, 2 Storage Closets, Near Pool and Clubhouse, Parking right outside in front, This condo is ready for move in, Off the market in Aug 2018 and Back on in Feb 2019 after building was repaired, Was not a rental, New Washer and Furnace/Water Heater/Fireplace serviced recently. MLS#9785963. Bluebonnet Services LLC.